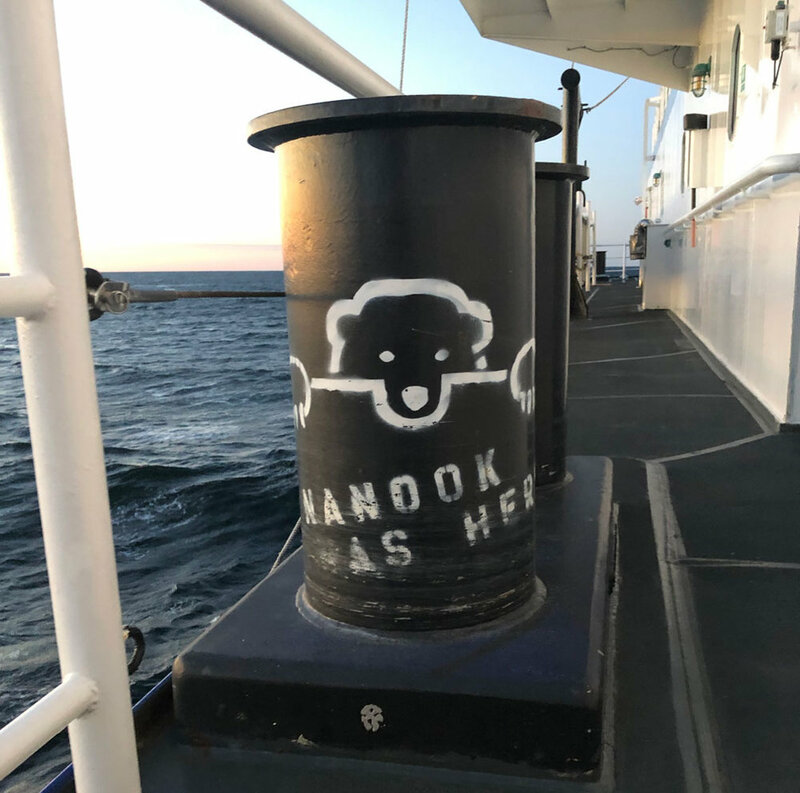 In March 2019 I was selected to participate in an artist at sea residency hosted by the Hatfield Marine Science Center and the Sitka Center for Art and Ecology. 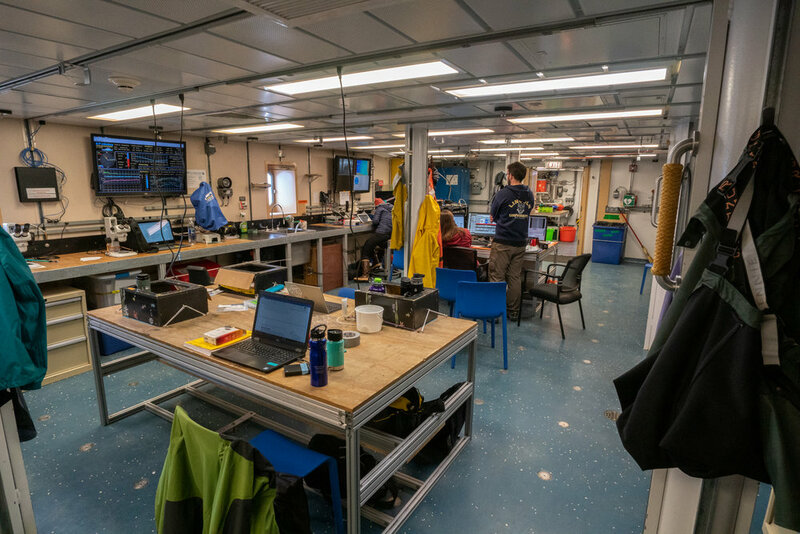 I spent twelve days onboard the Research Vessel Sikuliaq with a team of researchers from University of Oregon and Oregon State University who are studying zooplankton in the Northern California Current, off the coasts of Oregon and northern California. My cruise was one of four, two winter and two summer, that are funded by the National Science Foundation. After my time at sea I got to spend a week at the Sitka Center for Art and Ecology reflecting on my residency and making work. 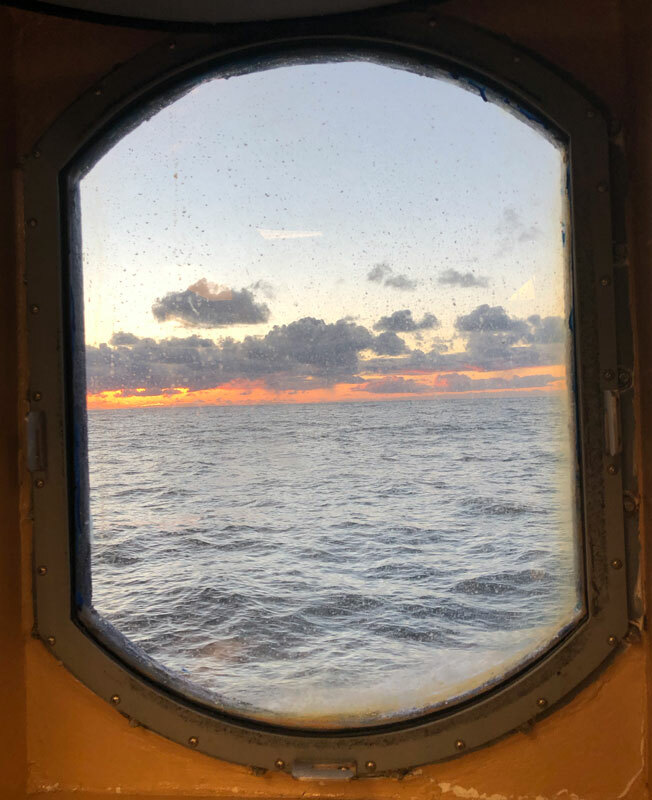 I’m putting together a blog series to share my time as artist at sea. 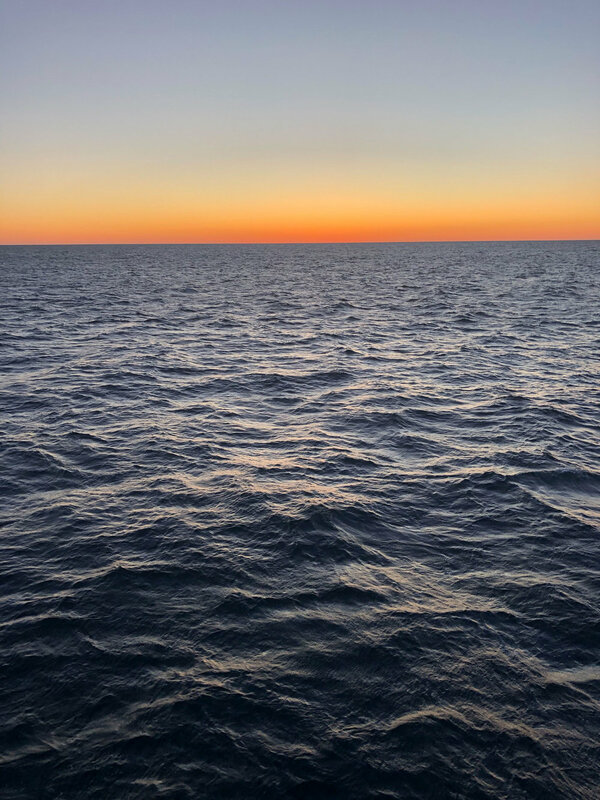 I think most people don’t get to see much of the backstory of what it is like to be an artist or a scientist out in the ocean collecting research. For me it was a pretty unique and fun experience so I am happy to take you along. In Part One (you are here) I’ll give a little introduction and tour of the research vessel. In parts two-three, I’ll go over two of the main systems used to collect data (ISIIS and MOCNESS) and share some of the art they inspired. 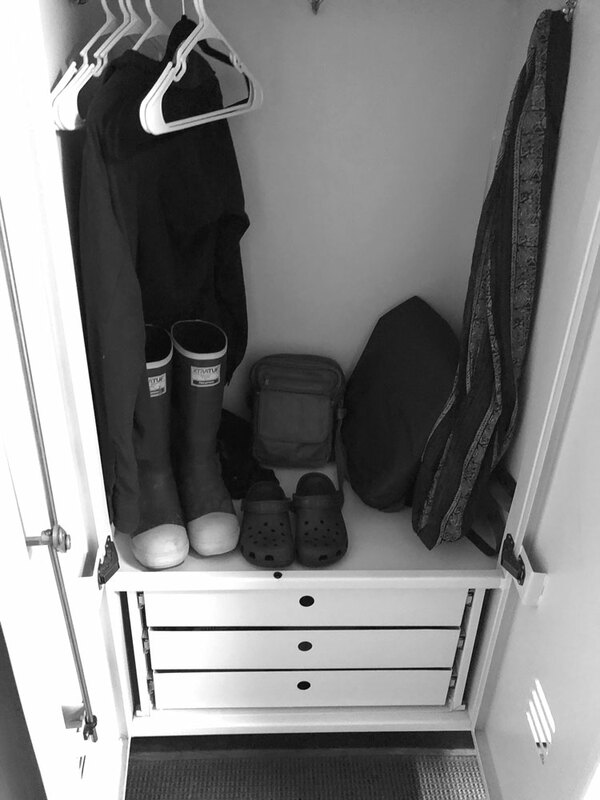 In part four, I’ll talk about being a resident at the Sitka Center and some of my plans for future work. Maybe there will be a part five, depending on how the rest goes. Before we begin, I should say that I am not afraid of adventure or doing something different at the expense of creature comforts. I enjoy a mountain expedition where you spend days on end with a small group of people not showering and having little privacy. I also don’t have very much experience on the ocean. The experience I do have has been in protected waters near Alaska – in Prince William Sound and the Inside Passage. 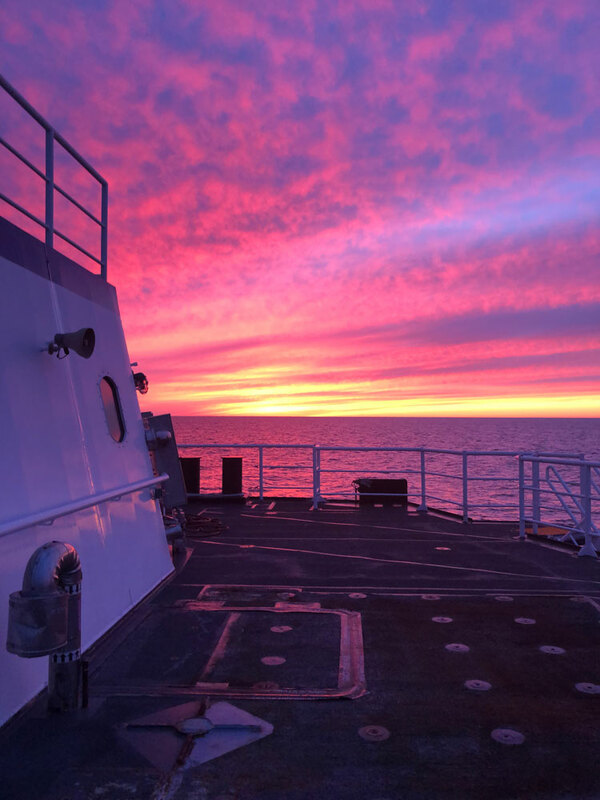 Going out on a research vessel was a new experience I thought I’d like, but I really wasn’t sure. Enough people asked me if I got seasick that I was pretty nervous about that. Also, I’ve never quite felt at home on or in the water, perhaps because I haven’t spent that much time there. Above- Intersections of the inside and outside worlds. 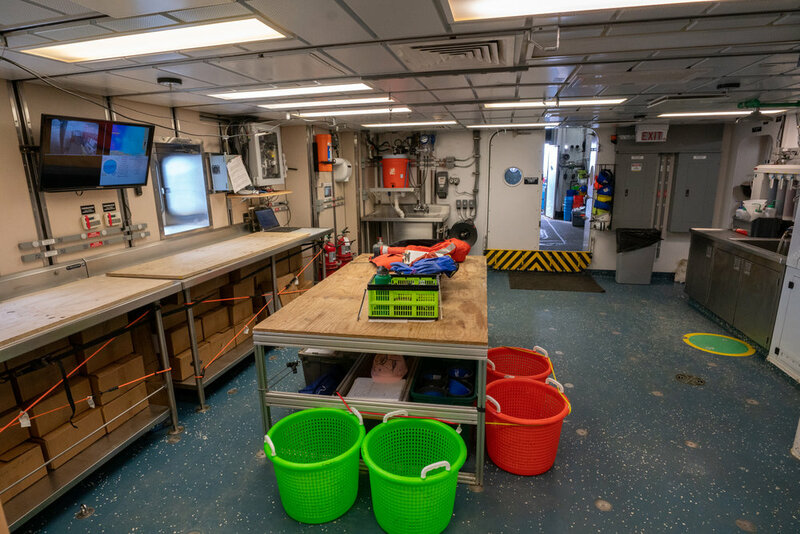 There are a big computer and monitors for ISIIS and tables and microscopes as well as lots of jars, sinks, and gallons of ethanol for sampling plankton. I’ll go more into what we were actually doing in the next two posts. I set up a work station on the ping pong table in the main lab. The scientists mostly worked in two shifts from 3 am – 3 pm and 3 pm – 3 am. As an artist in residence I could work my own schedule, but there was almost always something happening, which could make it hard to sleep. I came to enjoy staying up later since things got quieter onboard at night. Also, more fish come up at night so we’d see cool things. ISIIS and MOCNESS also lived on the back deck and would take turns getting launched in the water to collect information. 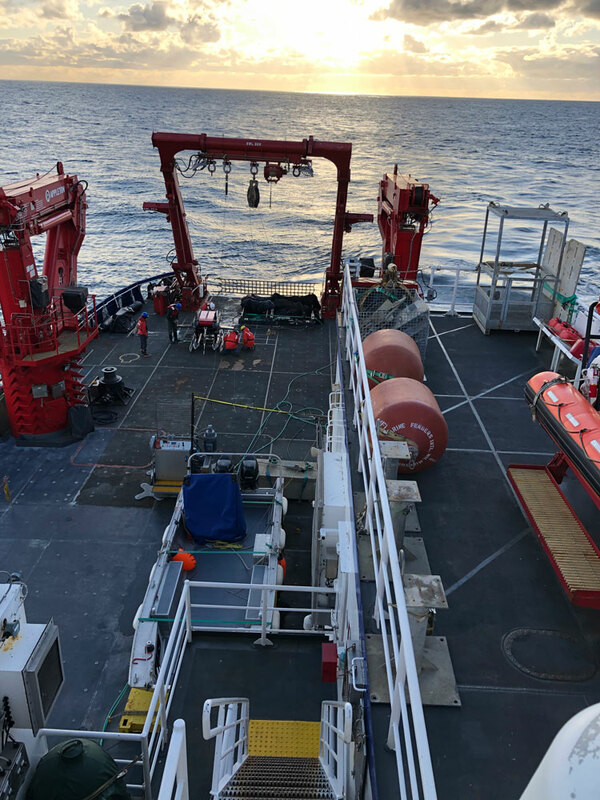 The crew and the science team were quite skilled at getting these big, heavy objects into and out of the water and driving them while they were down there. That was quite impressive to watch. Back deck. There is probably a fancier, maritime name for it. We had some really nice weather and I found a lovely spot up below the bridge with a picnic table where I liked to hang out. It was beautiful outside on all kinds of days. We saw some lovely sunsets, whales, birds. One night I remember being outside on fairly big seas (to me) with the sea lions barking and the sea gulls flying around. Despite my earlier reservations I came to love our strange floating world surrounded by the ocean wilderness. 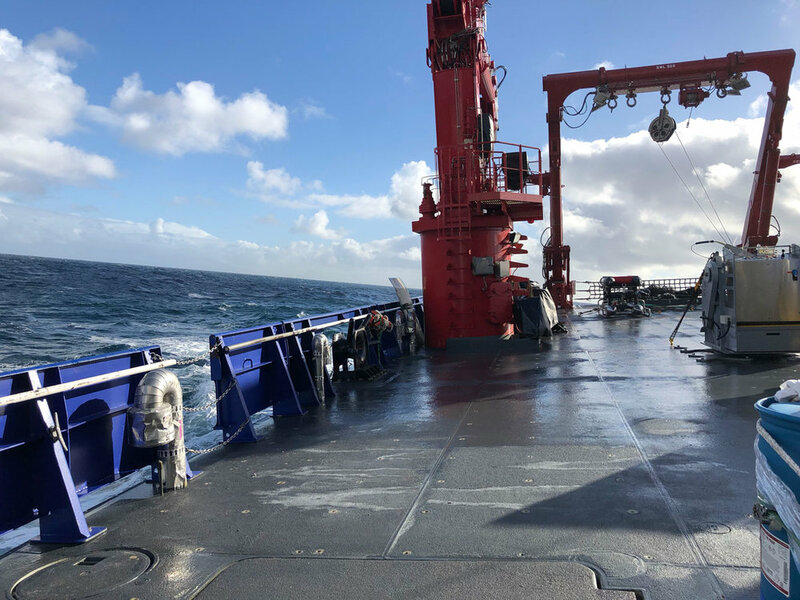 The weather wasn’t always nice and we had a few days of rough seas. The last day when we were transiting back to Newport from Trinidad I pretty much did nothing except walk around the ship and try not to get seasick. I was lucky that I didn’t get seasick, but I didn’t think I could stop and work on anything. We waited an extra day for the swells to calm down before getting into Newport. All in all, being on a research vessel was more comfortable that I expected. I had more personal space. The crew was awesome and we had really amazing food. 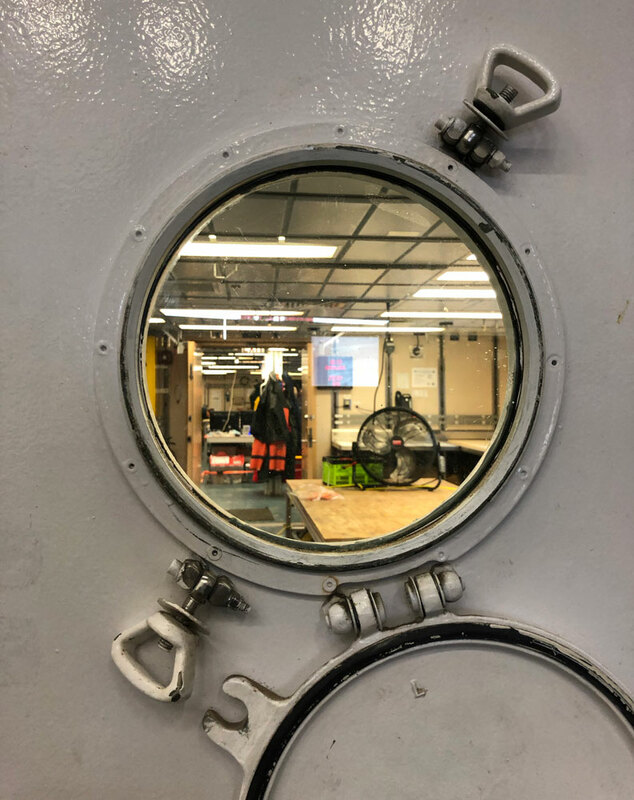 Also, the R/V Sikuliaq is actually from UAF, so I pretty much felt right at home (like I never left Alaska) with snowshoes hanging on the wall in the galley and a Dawn Gerety print in the bathroom. 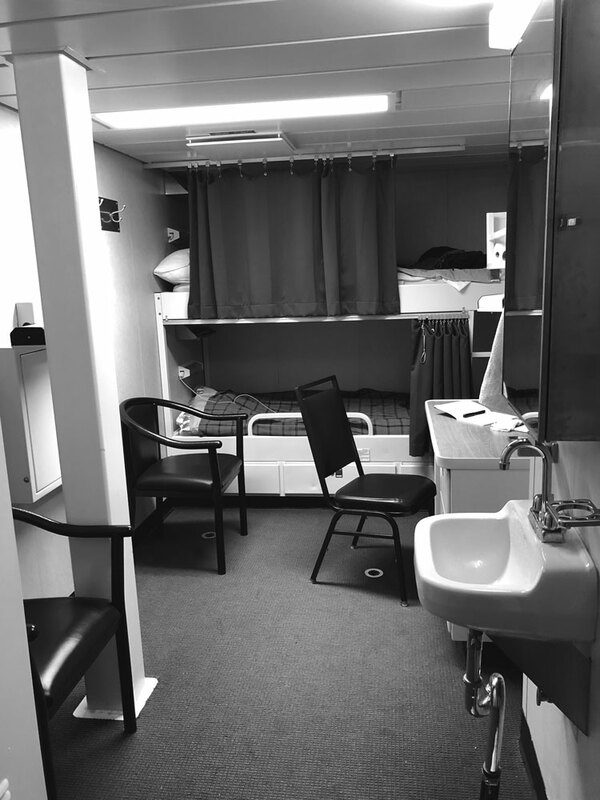 Above - Onboard the Sikuliaq: Lab spaces, computer room, Galley and amazing food, my berth I shared with a roommate - it looks small but there was quite a lot of space, Nanook was here (First five photos curtesy of Mark Farley at the Hatfield Marine Science Center). Above - Another pretty sunset!